Nick C. Waycaster, age 96, of Marion, passed away peacefully on Saturday, February 9, 2019 at his home. He was in the loving company of his family when he transitioned from this side of eternity into the presence of his Savior and is now reunited with the love of his life, his dear wife of seventy-six years and three months, Ethel McKinney Waycaster, and sons, Nick Berley Waycaster Sr. and Kenneth Louie Waycaster Sr. A native of Mitchell County, he was born on October 31, 1922 to the late Rex Waycaster and Georgia Culbreath Waycaster. Nick was the founder of Waycaster Stone in Marion and it could be said that he was the founder of the stone industry in Western North Carolina. Nick answered the call to serve his country during World War II and served faithfully in the 339th Quartermaster Corps which landed under withering fire on the beaches of Normandy. His unit fed and cared for more than 170,000 troops and was responsible for supplying everything “from beans to bullets and everything else”. Slogging through the hedgerow country of France, Nick was shot in the head by a sniper but survived. His comrades killed the sniper and mailed the rifle he used to shoot Nick back to his wife in the States. He survived five major battles including the Battle of the Bulge earning the Bronze Star for Valor, the Purple Heart, the EAME Medal with four bronze stars (representing each tour), the Good Conduct Medal, the Meritorious Medal and the Victory Medal. An article highlighting his war service was published in the McDowell News in December of 2018. Nick worked his entire life and loved every minute of it, making many good friends over the years. He was driving up until June of 2018 and only gave up his CDL in the past few years. 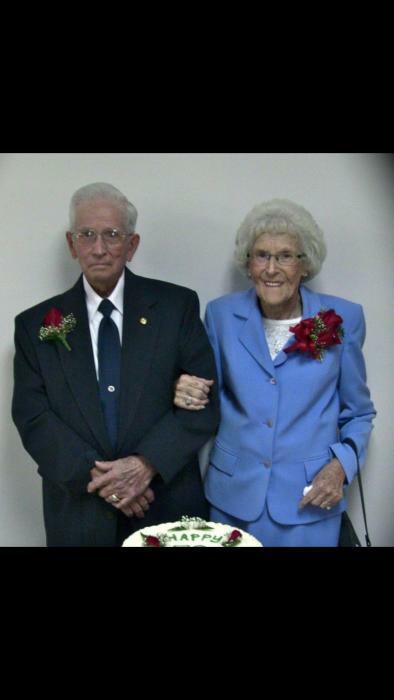 He was a member of Hicks Chapel Baptist Church for over 76 years. He was a member of the Joppa Lodge 401 in Old Fort and was also a member of the Scottish Rite and the Oasis Shriners. He was a good man with a humble spirit and was loved by all who knew him. He will be deeply missed. Saddened by his passing are three grandsons, Nick B. Waycaster, Jr. and wife Kelly, Kenneth Louie Waycaster, Jr. and wife Tonya, and Michael B. Waycaster and wife Angie, all of Marion; numerous great-grandchildren; a sister, Marilyn Wood and husband John of Little Switzerland; and special friends, Lester Fender and Darrin Helton. A funeral service will be held Monday, February 11, 2019 at 3:00 p.m. in the chapel of Westmoreland Funeral Home in Marion with Rev. Chad Wise, Dr. George Ellis and Mrs. Jo Pyatt officiating. The family will receive friends from 1:00 – 3:00 p.m. prior to the service at the funeral home. Honored to serve as pallbearers are Jeff Waycaster, David Waycaster, Lester Fender, Johnny Davis, Darrin Helton and Mitch Gillespie. Burial will follow in the Hicks Chapel Baptist Church Cemetery where he will be laid to rest beside his wife and two sons. The family wishes to express their deep appreciation to the staff of CarePartners Hospice McDowell and other special caregivers for the loving care extended to Nick and the entire Waycaster family during his illness. Flowers are appreciated, however, those desiring to make a memorial contribution are encouraged to consider CarePartners Hospice McDowell at 575 Airport Road, Marion, NC 28752.